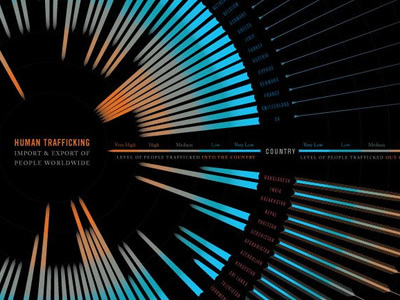 For his Communication Design thesis class at Parsons School of Design, Taulant Bushi created this striking poster which examines global human trafficking. 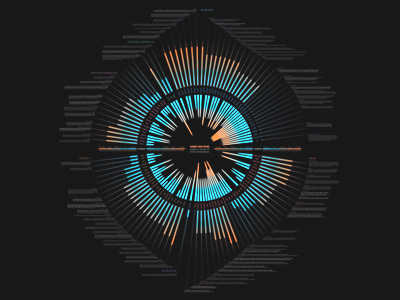 It depicts each country's level of involvement (from Very High to Very Low) as either a country of destination or origin. While this poster is aimed to be aesthetically pleasing, its primary purpose is to display information clearly, in different levels of hierarchy, each becoming clearer in different stages, in order to educate and incite protestation. All research data came from sources such as the UN and a few other organizations that maintain databases of numbers regarding abuse towards women and children. The project concentrates on the smuggling of people from one country to another - mainly illegally. In many cases these people are forced to do work that is illegal, such as prostitution or child labor. All of the text on either side of the circular design covers detailed information made available for each country. The idea of the poster is that the closer the viewer gets to it, more detailed information is revealed, such as numbers of children of a specific country being involved in prostitution or child labor, or other information. Unfortunately, there's not enough resolution to appreciate the detailed information on the poster, but the overall outcome is easily perceived. This is a strong and fine piece of work. I saw it move, turning to show an eye blinking, then turn back to display the nasty details.....animated. Thank you for this naked truth. May I receive a copy of this? I am printing it on our printer, but i imagine you have a quality image we could use. OUr Sisters are getting involved in Stop Trafficking. We'd like to add your poster to our display materials. thank you! Would it be possible to provide a readable image? The text is extremely small, and difficult to read. [Ted] I had to remove the URL you provided by request of the author. If anyone wishes to have access to a higher resolution version of the piece, please contact the author directly.